*Please note that all routers are different and as such may require different configuration steps. You are highly encouraged to bring your router to ResNet for configuration if you own a smart router, an Apple or Google Router, or are having problems configuring your router. As a note, you will need a working ethernet port on your laptop/desktop to plug into, or have an ethernet adaptor if you do not have a port on your device. Note that some locations on campus have been upgraded to a solely wireless system and so do not require a router and therefore have no active ethernet ports. See our Network Upgrades page for more information. DO NOT connect the wall port to any port on the Router yet! Enter the IP address found in your wireless settings (Settings>Wi-Fi>Hardware Properties for Windows 10/ Network Preferences for Macs) into the Address Bar of your browser. Most IP addresses start with 192.168. Push Enter. User name is often blank or "admin". Password is often blank, "admin", or "password"
Password is often blank, "admin", or "password"
Write down your Wireless Network SSID, it will be used for later. Do not share your SSID or password with anyone unless you trust them. Users can piggyback on your credentials and crowd your network. You must secure your wireless network, failure to do so may result in disconnection by ResNet. Your Security Mode should be using WPA or WPA-2. Set the "WPA algorithm" to "AES"
(if available) otherwise, use "TKIP"
Type in your WPA Shared Key. It should be between 8 and 32 characters- the longer the better. Make sure it is something you can remember but that is hard to guess. You may want to write it down, temporarily, so that you can remember it for when you configure your computer to connect to the now-secure access point. 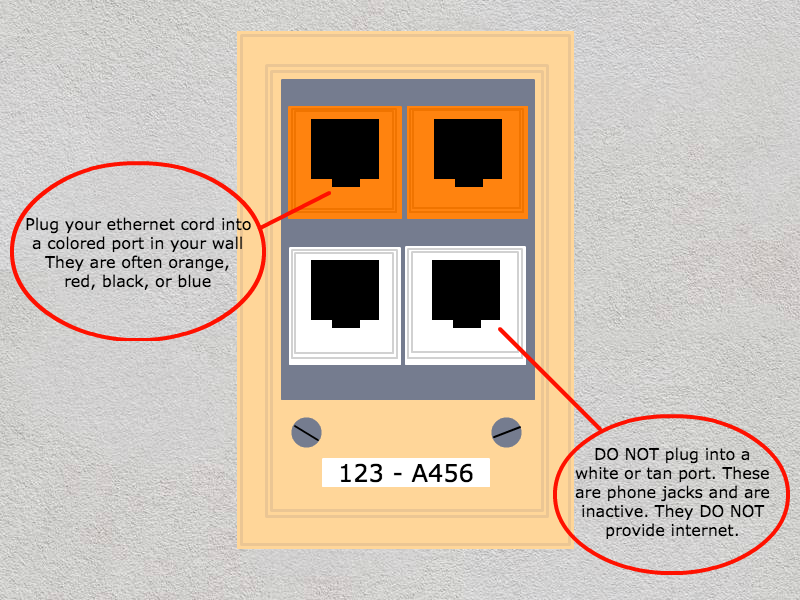 Connect to a colored port in your wall (tan/white ports are phone jacks and DO NOT provide internet).